Go Fish is a fun card game that uses a standard 52 card deck. It can be played with 2 people or more. The first thing you do is deal cards to the players. For 2 to 3 players you deal each player 7 cards. If there are more than three players, deal 5 cards each. The rest of the deck is then spread out in the middle of the players face down. This can be called the pool of cards. Each player gets a turn in clockwise order (to the player's left). During a turn the player asks another player if they have a particular rank of card. For example, the player may ask Kathy if she has any nines. If Kathy has any nines, then she must give all of her nines to the player. If Kathy doesn't have any nines, then she says "go fish". When you "go fish" you can take any card from the pool. If the player gets the cards they asked for, either from the pool or from Kathy, then the player gets another turn. If the player gets all four suits of the same rank, then they can put the cards face up in front of them. For example, if you already had a nine of hearts, clubs, and spades; then you picked up the nine of diamonds from the pool, you then get to place the set of nine cards down in front of you and you get another turn. Go Fish is over when one player runs out of cards or there are no more cards in the pool. The winner is then determined by who has the most piles or suits of cards in front of them. Try to memorize what cards the other players have and want. If you pick up a card rank from the pool that you didn't have, it can be good to guess that rank on your next turn. Try to Go Fish more at the start of the game. This gets you more cards and a better chance of getting more books and matches later. Keep play the game until all the cards run out. When the pool is gone you no longer get to Go Fish, it just becomes the next player's turn. Try playing where you try to get pairs of cards instead of fours. Players ask for a specific card instead of just a rank. For example, you would ask for a nine of diamonds, rather than just all nines. 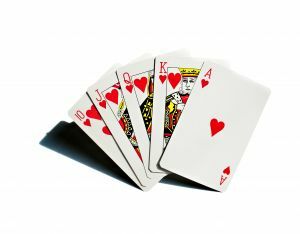 At the end of the game, deduct a point for each card a player is holding. This way players have to balance between wanting a lot of cards to get matches and getting rid of their cards before the end of the game. Try playing with two decks and passing out more cards to each player.